Hello everybody! It's time for more of "Max's Dinosaurs!" Last spring, my great friends Ben and Ashley were eagerly awaiting the birth of their son, Max. They hired me to do four original illustrations for Max's nursery. My last couple of posts (here and here) have been a look into my process creating the two black and white ink drawings of dinosaurs. For this post I'd like to start sharing how we approached the less realistic, "cartoony" watercolor paintings I made for Max. None of these characters or drawings were necessarily intended to be used in the final paintings, but just as a way to feel out which approach to take. After sending scans to Ben & Ashley, they picked out their favorite ones and gave great feedback about why they liked some more than others. 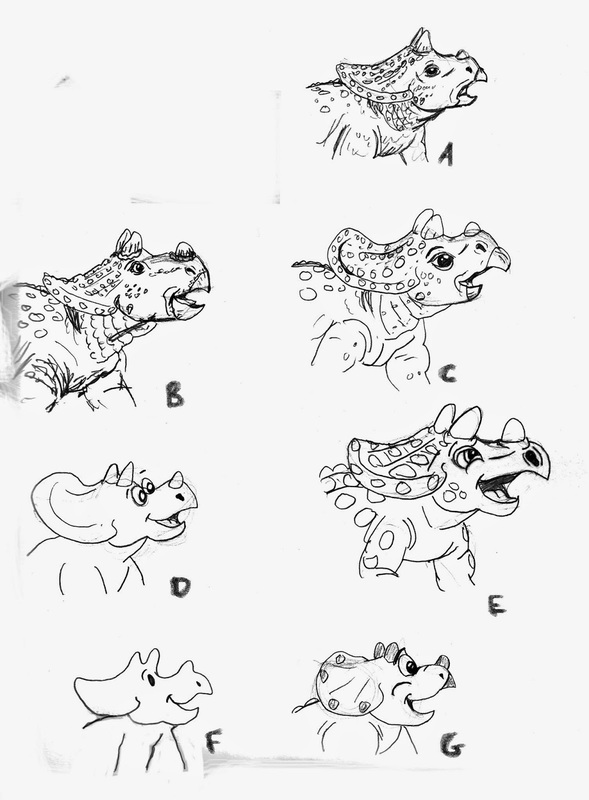 I knew they wanted a triceratops type dinosaur in one of the illustrations for sure, so I sent them this page of baby triceratops sketches. As you can probably tell, each one is a different approach to drawing the subject. Max's parents each chose their favorites, including which elements they liked the most. After that, it was only a matter of combining those elements together into "one stylistic approach" in the two watercolors. And deciding what, specifically, the paintings would be of. And landing on what the compositions, colors, and character designs for each would be. Ok, there was still quite a bit to do. But guys, this part is pretty fun! At the top of this page, you can see one of my first attempts to combine the different style and approaches into one that would be the most like what Ben and Ashley wanted. It's still not the final design, but everything that came after were only slight variations of this approach. 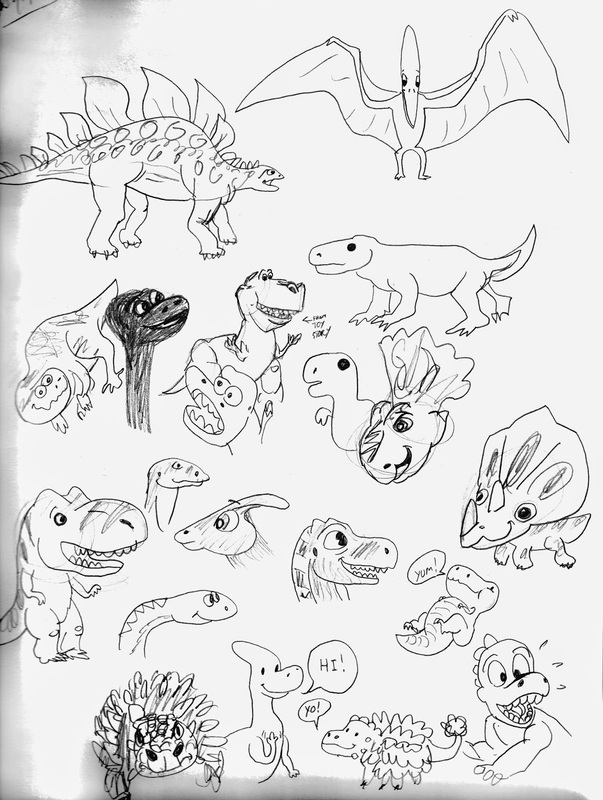 All around the little guy, you can see thumbnails of possible subjects and compositions (including a couple that were for the stegosaurus drawing I shared before.) I came back to this page and sketched out some possible lettering at the top, after we decided which scenes I'd paint. Above and below, are more rough sketches I used to develop possible scenes the cartoon dinosaurs could be in as well as which dinosaurs would they would feature. 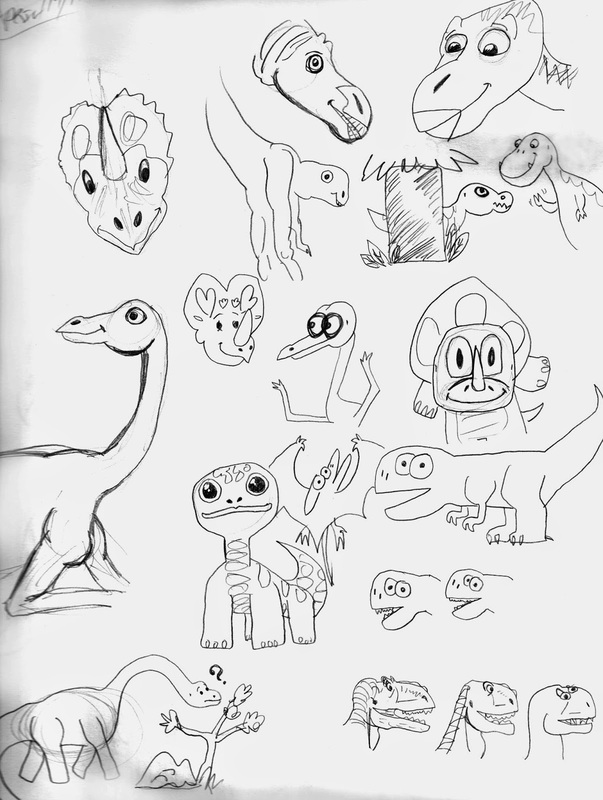 You may even recognize a few familiar dinosaur characters from other sources that I enjoyed when I was a kid. I drew these to help me get into that fun head space and to generate more ideas. You may have noticed that a lot of these sketches feature Max's name. What a good eye you have! That's because I knew that his parents wanted one of the paintings to incorporate his name somehow. I couldn't shake the idea of his name big, bold, and carved in stone with dinosaurs surrounding it. After sketching out some other ideas too, it was clear. This was the idea I had to use! Here are some sketches where you can start to see glimpses of what the final painting would look like. As I continued to design and add more and more dinosaurs, I continued to rework the composition. Sometimes, I could tell the composition needed something else and made another dinosaur character to fill that need. In the next post about Max's Dinosaurs, I share with you what steps I took to turn these rough drawings and doodles into a finished watercolor painting! I hope you enjoyed this look into my process. I had so much fun doing these paintings! Until next time, God bless!